Hi everyone here's and update on the spring events. These apply to all sections unless noted. This is a great awareness event for the environment! You can read more about this in my previous post, here. The Toronto Star is having a contest and is giving away 60 bicycles, here. For more information see our update, here. Tickets are available for a Blue Jays .v. the Detroit Red Sox. Talk to your section leaders if you are interested so that we may help organize this. More information can be found here. Beavers and Cubs will participate in our annual pitch-in event at West Deane Park by the picnic area off Martingrove. Lunch is provided. Scouts and Ventures will be participating in a tree plant in the Rouge Valley. Year end camp at the Wye Marsh (near Midland) - June 20-22, 2008. Section leaders will need to confirm who will be coming. This is the closest thing to a policy on Commenting, Spam, and offensive language in comments. Our annual Baden Powel Banquet was held on Wednesday, February 20th at St. Lukes United Church. 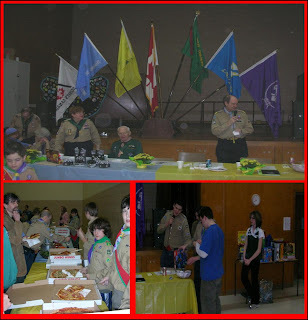 The Scouts served up Pizza. There were announcements, toasts, and thank yous. And a raffle. 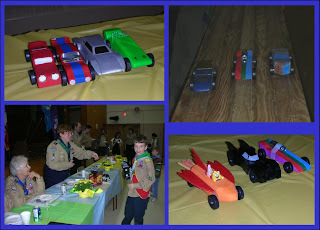 Kub Kar, Beaver Buggy, and Scout Truck races were held before dinner. Awards were given to the fastest Kub Kar and the best design (as judged by the Beavers).